posts. Total vacancies available in Palghar District Collector Office recruitment 2018 are 20 posts. 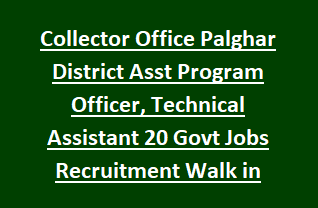 Applicants who are willing to apply for Assistant Programme Officer, Technical Assistant Jobs in Palghar Collector Office recruitment may attend walk in Interview held by Palghar district Collector Officer Authority. Walk in Interview will be held on 02nd January-2018 at Jilhadhikari Karyalaya, Palghar. Candidates will be selected for the above vacancies based on their performance in Interview held on 2-01-2018. Selected candidates will be paid Rs. 14,000/- per month. More information regarding Palghar District Collector Office Recruitment of 20 Assistant Programme Officer, Technical Assistant Jobs Selection method, Application procedure, Age limits, pay scale are mentioned below. Collector Office, Palghar district has released total 20 vacancies, which are given below. Assistant programme Officer: Candidate must have MBA/ MSW qualification from recognized University. Technical Assistant: Candidate must have completed Engineering degree in Civil/ Agriculture from recognized University. For Detailed qualifications see the Palghar Dist official notification. Please visit Official notification for Age limit and relaxation details for the above vacancies. Pay Scale for Technical Assistant and Assistant programme Officer is Rs. 14,000/- per month plus Mobile allowances. Candidate Selection for Technical Assistant, Assistant programme Officer vacancies in district Collector Office Palghar Recruitment is depends on their skills in Interview. Interested/ talented candidates for Technical Assistant jobs may go through the Palghar district official website http://palghar.gov.in/# and download the official advertisement. Read the advertisement fully. Candidates who meets the complete eligibility criteria may attend the walk in Interview held by the selection authority. Candidates must have to carry the application form, required Certificate copies while attending the Interview.